The review marked another phase in the evolution of jointery , the taming of the service tribes and elevation of the Defence Force chief so his power matched his title. As the military shifted from the Old to the New Testament  it created new names and identities—crucially, the Australian Defence Force and CDF (wonderful examples of the invention of tradition). In 1984, the CDFS became Chief of the Defence Force (CDF)—a recommendation of the Utz report that the top military job had to have clear authority to match its responsibilities. 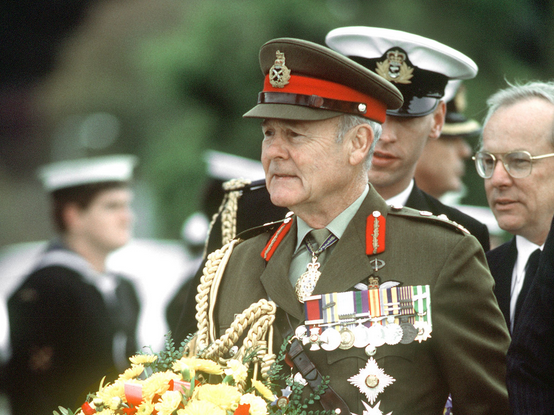 The first CDF, Sir Phillip Bennett  (pictured), built substance into the new name and continued the fight to get staff to go with it. Mobilising the symbols, he had the sign ‘Headquarters Australian Defence Force’ placed outside his Russell office and the number plate ‘ADF 1’ placed on his official car. Graeme Dobell is the ASPI journalism fellow. Image courtesy of Wikipedia .